You can still enter both giveaways. On Monday, I'll draw the winner for the Violette Between and post the title for another book I'm giving away. Look out November . . . 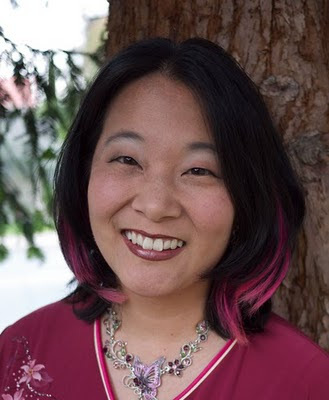 I registered for NaNoWriMo, National Novel Writing Month! 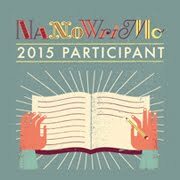 I’ve known about NaNoWriMo for several years, but this is the first year I’ve actually registered for it. To be honest, this is also the first year my novel-writing-schedule has happened to be timed right so that I can participate. In other years, I was either at the end of a manuscript, or I wasn’t even in the preliminary stages of plotting out the manuscript when NaNoWriMo rolled around. This year, I am setting the goal of getting this next manuscript plotted out so that I can start working on it November 1st. I’d really rather not spend the entire month of November writing complete crap. I don’t have time—this manuscript is due January 1st. Therefore, I intend to plot my little heart out. I will even break out the Excel spreadsheets! Technically, I can’t bring any previously written stuff to the table. Technically, I won’t—I’ll be writing all new words during the month of November. However, I already wrote the first chapter of this manuscript for my Marketing Info Sheet, and I’m not about to scrap it. One of the founders is Chris Baty, and he wrote an amusing and encouraging book called No Plot? No Problem! especially for NaNoWriMo participants. NaNoWriMo is NOT just for serious writers. It’s for absolutely ANYONE who has always wanted to write a novel but never got around to doing it. So I hope some of you guys will join me in this! Why not, right? Writing: I posted a few links on podcasting for writers at the CAN Marketing blog. 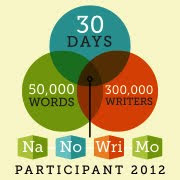 I signed up for NaNoWriMo, too. This is my second year. I love No Plot, No Problem. I'm trying to get my entire local RWA chapter to do this; we have a bunch of women who want to HAVE written but don't really do any writing. I'm president next year (provided no one else wants the job - yeah, like that'll happen) and it's my mission to get this chapter writing. Last year I literally signed up on 31 Oct and had no real plot in mind. Just an idea, and I haven't had a chance to go back and edit it. Now I have two other books that need polishing and here's November again. At least I'm producing, even if it's not sell-able yet! Me too! I'll be working on a manuscript that will be a contest submission at the end of the year. I've written and sold short stories before but this will be my first complete novel manuscript. I'm plotting now so I too will have something reasonable to work with at the end. Then, I'll polish the first three chapters, send them off, and keep working on the rest. I signed up for it too and boy oh boy am I going to end up getting nervous!! I heard about it through a blogger who participated last year and she loved doing it. She also made it sound like a great idea. Then I'd kind of let it slip my mind. Thanks for reminding me! lol. Now I just gotta plot out a novel before NOV 1st! Ha, yeah. I can see that happening! That's as deep as I can manage with a migraine hitting. This is my first year signing up. I have written a partial outline for my second novel, so I going to use this opportunity to get it started. I'm signed up but will have to see how my schedule looks at the time. My first year trying I made it to 50,000 words just under the deadline. What an amazing feeling to have produced so much material in such a short amount of time. It really expanded my idea of what was possible. Good luck to you! Can't wait to see what you come up with. I'm still on the fence about nanowrimo. I have a book to write, but I'm 7000 words in already. I'm just not sure. I am in because I need motivation to actually get it written. Well, I'm signed up! Have no clue how my manuscript will turn out, but at least I'll write my heart out all of November.